The Electric Reliability Council of Texas has cancelled a warning issued Monday asking Texans to conserve power or face rolling blackouts. ERCOT first issued a Level 2 Power Warning at about 7:20 a.m., indicating reserves had dropped below 1,750 megawatts. The text of the alert said simply: "Reduce electric use now. Risk of power outages exist throughout Texas. Power warning in effect." In the 7 o'clock hour, ERCOT said electricity demand reached 55,486 MW. As demand decreased, the group later reduced the warning to an EEA Level 1 Power Watch after implementing the first two stages of steps to protect the state power grid. At the EEA Level 1, reserves are below 2,300 MW. Though the grid has returned to normal, ERCOT still urges conservation as cold weather is expected to draw a high demand for power through Tuesday. While hundreds of homes in Burleson are without power and keeping power crews busy, heating repair crews have also been busy. "Cold weather will continue through tomorrow [Tuesday] morning, and we will continue to monitor conditions closely," said Dan Woodfin, ERCOT director of System Operations. “Consumers are encouraged to use electricity wisely, and a conservation alert remains in effect throughout the ERCOT region." On a conference call late Monday morning, ERCOT revealed two power plants went down early Monday due to equipment falfunctions in the cold and that if one more had gone down they probably would been forced to initiate rolling outages due to the unexpected loss of the ability to generate power. 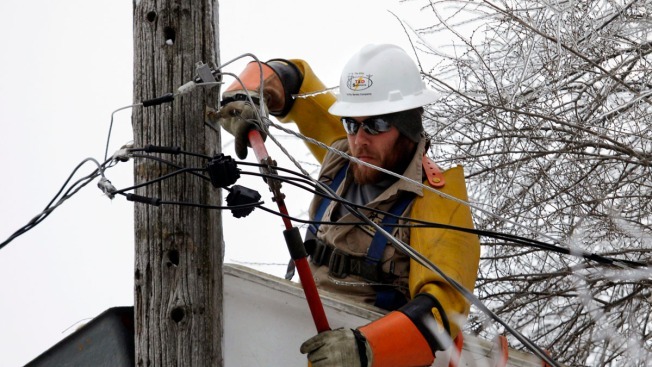 Unexpected major losses of generation could force operators to proceed with additional emergency procedures to avoid an uncontrolled statewide blackout. ERCOT did not reveal which plants went down, but said they would be checking with all facilities to make sure they're doing what they need to do to make sure they can meet demand early Tuesday morning when temperatures are again expected to drop to about 20 degrees. Alerts are issued by the electric reliability group when extremely high demand or unexpected loss of generators have occurred. Thousands of North Texans went without power during some of the coldest temperatures of Winter. As of 8:21 a.m., over 9,000 Oncor customers in North Texas were without power. At 10:30 a.m., those numbers had dropped to 5,300 in Tarrant County with the vast majority of those outages (4,600) being in the Burleson area. In Wise County, 1,100 remain without power. By 2 p.m., there were no reported outages in Wise County and the number of Tarrant County customers without power had dropped to a little more than 300. The issue in Burleson was reclassified as Johnson County, where at 2 p.m. 4,600 were still without power. By 5:30 p.m., that number had dropped to 2,300. The City of Burleson opened a warming center at the Brick, which is their recreation center. Kathy Hawkins brought her son there after their house dipped into the 50s. “You can’t do anything tin the house. You can’t even eat because you can’t open the refrigerator. You can’t heat anything,” said Hawkins. Airco also received calls from people who had problems with their heating systems. “Every system in town has been stressed more than it normal is because it is so cold. It has been running and running and running trying to keep up, and if something is weak it is going to fail,” said Dave Dunham of Airco. There were no rolling blackouts initiated Monday, despite the warning issued by ERCOT earlier in the morning. The power outages are normal outages due to weather or other conditions. Oncor's automated storm center reported that most of those customers should see their power outages resolved by 11 a.m. Monday.